Today has been one wonderful creative mega day. I had the pleasure of doing my PMC (Precious Metal Clay) class. The clay consists of finely ground silver with some sort of mysterious ingredients to make it pliable clay. Once moulded to your design it is cured so the moisture dries out and then fired until it reaches the correct temperature. 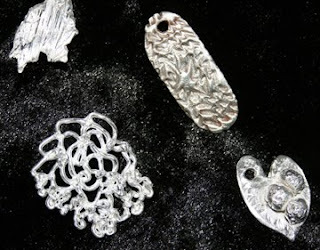 Once it has cooled it is brushed, buffed or whatever and you have a beautiful silver piece. I am so pleased with the four original and one off charms I have made. It is not a cheap option to making silver pieces but just a different way. I always get so amazed with the way I feel after I have had a day of creativity, it’s a great feeling having that high. “Davine Time” update: Indulging myself in my creativity. They are stunning, Davine! WOW! You always sound like you have touched something magickal, when you have been creating. Those are very pretty and would give you a sense of satisfaction. Good day's work!